The intensity of the fire of a flashy red suitcase and a scarf with a colorful pattern will surely highlight it in this season. Enhance your unique style with deep, warm tones, combined with the gleam of gold in elegant, timeless pieces. A light and spacious suitcase with a rounded top. 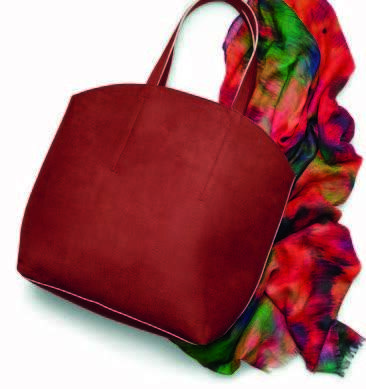 Imitation suede in a fabulous shade of red, with beads and beige lining. An indispensable bag in your collection. Dimensions: 30 x 11.5 x 36 cm. The ideal companion for your Fire Suitcase, imitation suede, elegant red tone, and round format. Perfect size for storing your valuables in your suitcase, or as a cosmetic bag to carry your essentials. Dimensions: 20 x 7 x 12 cm. Beautiful soft polyester scarf with an abstract design and a lovely warm color palette. It has a fringe for a quality finish. Dimensions: 190 x 70 cm. 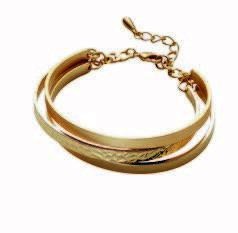 Bracelet with 3 wonderful bracelets. With a combination of matte gold finish, polished surface, and hammered effect. Nickel tested. Unique size. Diameter 6.3 cm. 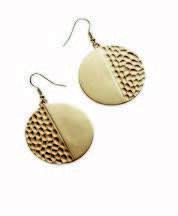 Earrings Gorgeous earrings with a wonderful combination of matt finish and hammered effect. Totally gold-plated. Nickel tested. Length: 5.4 cm. Diameter 3,5 cm.